You can find “low-hanging” keywords with decent traffic but aren’t that difficult to rank. You can get truckloads of insight about the keywords, helping you decide whether targeting a certain keyword would be too much of a mission, or if it’d be a feasible keyword to target. You can find long tail keywords in seconds and evaluate them for ranking difficulty. You can find clues on how to outrank your competitors. You can find websites that are perfect to target for link building. Of course, these are just some of the many ways you can use our program to help you with your keyword research. The best part is, our dashboard looks clean, clutter-free, user-friendly, yet it still provides tons of value to our user. That said, you won’t have to worry about getting overwhelmed with numbers; we tried to simplify the user interface/experience as much as possible. 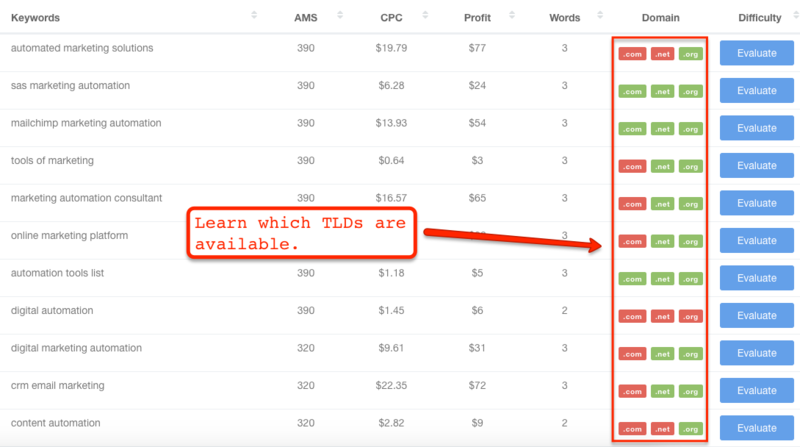 Let’s dive deep into the nitty gritty of our Keyword Research tool. From the dashboard alone, you’ll get an overview of the keyword searches that you ran by clicking on “saved searches” or “Today’s Searches”. When you’re ready to start a new keyword search, simply enter your keyword into the keyword field and then select your desired search location and search language, then click “Search”. Remember to change your Search Location and Search Language since changing these will have an impact on the search results. Changing the Search Location can change the Average Monthly Searches (AMS) of the keywords, while changing the Search Language can change the keyword output you receive. Here’s how the results would look after you enter your keyword and select the “Search” button. 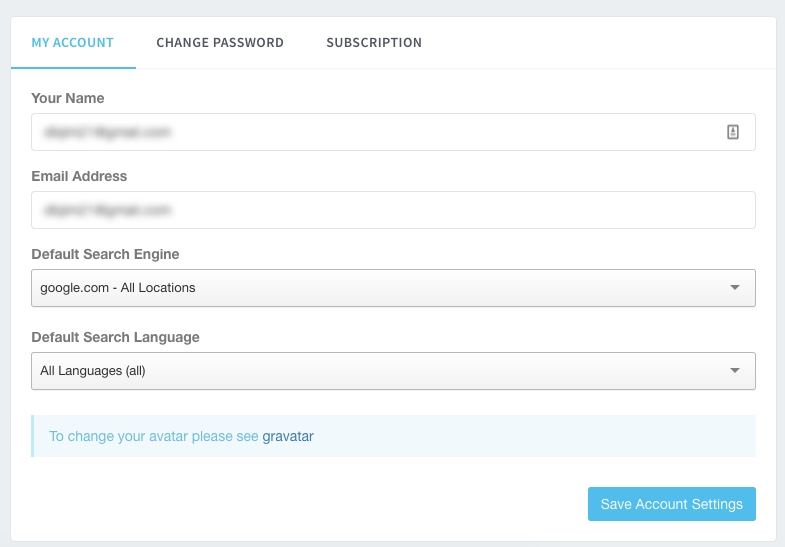 If you’d like to change the default language and location settings, you can go to your user profile to make the change. 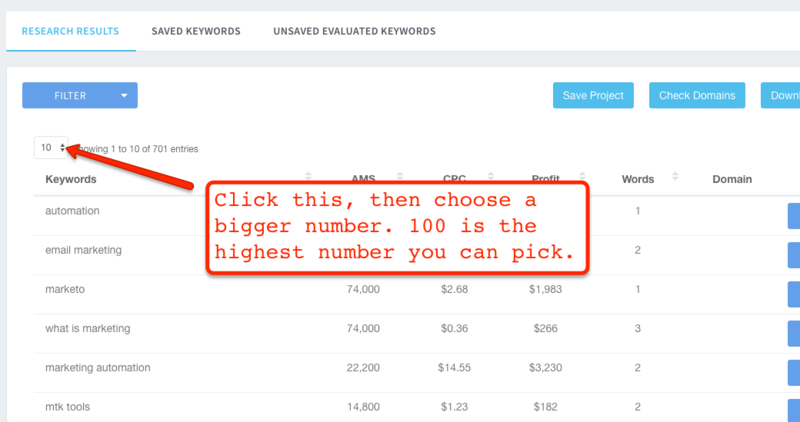 Our Keyword Research tool’s default setup will only show ten results/entries. That way, our users won’t feel overwhelmed with all the data that they can see on their screen. However, If you’d like the program to show more entries instead seeing them by batches of ten, then you can change the setup by click the drop-down option, which you can find directly below the “Filter” button. Our users love our Filters feature. But before I tell why they’re ecstatic about it, let’s look into what’s under the hood of the feature first. As you can see, the type of sub-functions you can find are pretty self-explanatory, yet they’re very helpful. Our users are especially happy with the “Number Of Words” function. Marketers nowadays know better than to target Head or Body keywords simply because ranking for these types of keywords are costly and time-consuming (to say the least). Most marketers — if not everyone — are now targeting long tail keywords (4+ word phrases) and our “Number of Words” function makes it dead easy for them to find their long tail keywords. Check out what happens if I enter number “5” in the empty field to get a set of long tail keywords. Within seconds, you’ll get bajillions of longtail keywords that you can look into, and possibly try to rank for. There are TONS of helpful insights that you can get from our Evaluation feature. In a nutshell, the feature will tell you how difficult (or easy) it is to rank for your prospective keyword. You can evaluate up to 3 keywords at once by clicking the blue “Evaluate” button to the right of the search results table. 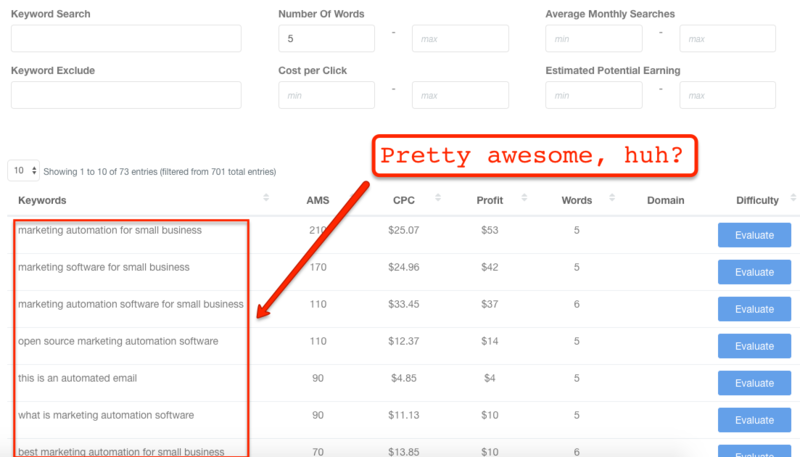 From the results page above, I’ll click the “Evaluate” button for the keyword phrase, “marketing automation for small business” to give you an idea of what you’d see when you evaluate keywords using our tool. The insights you can get from the page can tell you if it’s a good idea to go after the prospect keyword. For one thing, you can look into the Keyword Difficulty score to give you an overview of how easy it is to rank for the keyword. Another thing worth mentioning about this page is how you can view a good bit of insight about the top ten pages that are ranking for the keyword in Google’s search results. You can see the pages’ DA (Domain Authority), PA (Page Authority), and the number of external links the page has (among other things). From the screenshot above, you can also get some insights on whether or not the pages are keyword optimized. These details are clues you can consider on how you can outrank your competitors. Additional tips for using the Evaluation page. 1.You can use the feature to look for prospective sites to build backlinks on. The Google Top Ten Ranking section is an excellent place to fish for sites that are worth linking to. When building your website’s backlink profile, you want to make sure that the prospective sites you’ll attempt to get a backlink from have stats that are more than decent (the PA, DA, and social shares, etc.). Or the sites whom you should build backlinks from are those whom Google loves. What can be a more telling sign that Google loves a web page than Google putting the page on the top ten of its search results page? You can use the feature to generate blog post ideas. If you’re running out of article topics, yet you’re gung-ho about finding out what article topics the people (and the search engine) loves, then you can check out the pages on the Google Top Ten Ranking section as well. 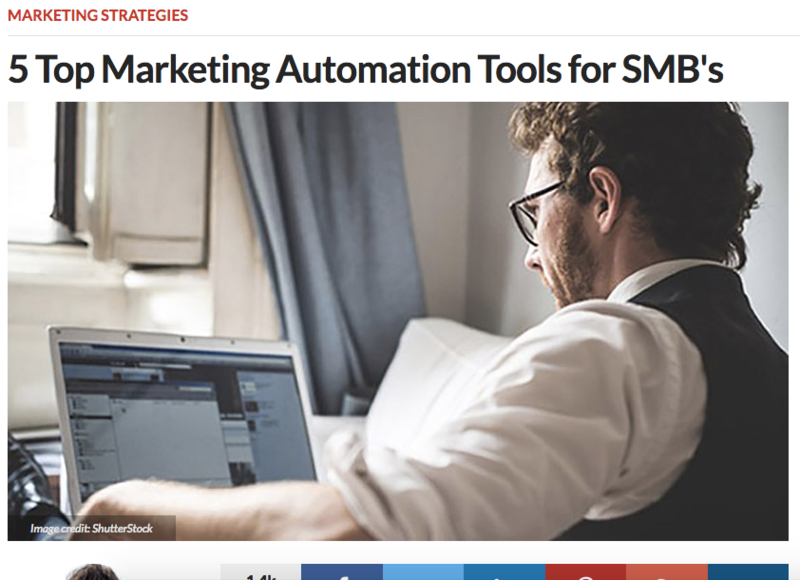 You’ll notice that in the sample keyword that we entered, a web page from Entrepreneur.com ended up showing on number 1. Because the page has a decent number of shares, it tells us that people loved reading about the article. Otherwise, they would not have shared it. At this point, all you need to do is open the page and check out what the article’s title is all about. Whatever title comes up, you can build your article ideas with the title’s overarching theme. Here’s what came up after I clicked the link. Now that you have a better understanding of the insights you can get out of the Evaluation page, the next step is for you to save the keywords whom you thought are a good fit after evaluating them. Here’s the thing, when you evaluate the keywords, they are not saved automatically. You have to click the blue “Save” button for the keyword to be included in your list of keywords in the “Saved Keywords” tab. Deleting a keyword from the “Saved Searches” tab is pretty simple, too. You just need to click the trash can icon to delete the keyword. The steps to download your keywords is pretty straightforward. You just need to click the blue “Download CSV” button which you can find in the upper right part of the “Research Results” tab. Our system will them prompt you to choose whether you’d like to download the evaluated keywords only, or if you’d like to download all the keywords in your list. Having your keyword in your domain name will give you an SEO advantage over your competitors who do not. 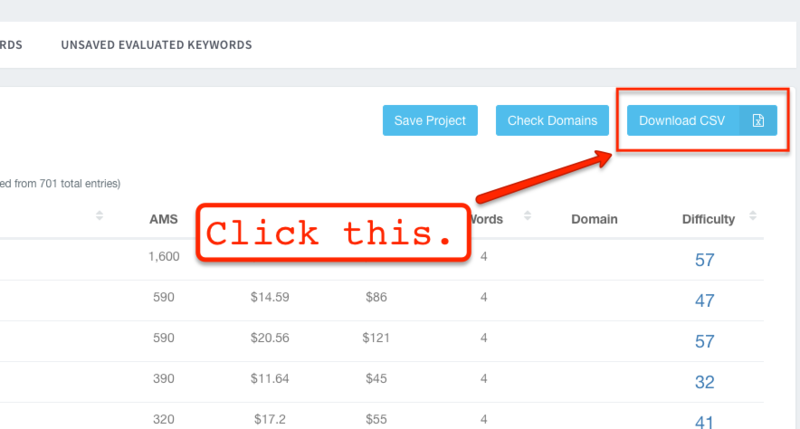 That is why the Check Domains feature is important since it can help you figure out which TLDs are available when paired with certain keywords so you can start hosting your very own website. To protect you from the recent Google algorithm update where they penalized Exact Match Domains (EMDs) with low-quality content, you can go for partial matches instead. When you partner partial match domain names with truckloads of lengthy and value-packed content, you are bound to outrank some of your competitors who are ranking in the Search Engine Results Page — especially those who are slacking on their marketing efforts. Are you looking for a keyword research tool that you can use to uncover keyword phrases that are worth targeting? If you answered with a “yes,” then please contact us now using this form. Copyrights © Keyword Revealer 2018. All Rights Reserved.